Senior right-handed pitcher Alex Siddle broke Southeast Missouri’s all-time appearance record with his 77th career appearance in Southeast’s 6-2 loss to Jacksonville State (26-11, 13-2 OVC) Friday evening. With the loss, Southeast slips out of first place in the Ohio Valley Conference and looks at it’s six-game winning streak slip away. Southeast falls to 27-11, 16-3 OVC. Joey Lucchesi (7-3) suffered the loss in his start. Lucchesi pitched five innings, his shortest outing of the season, allowing four runs on five hits. He struck out nine but five walks led to trouble for the lefty. Graham Officer (7-1) picked up the win in his start for JSU. Officer worked six and two-thirds innings on the mound, allowed two runs, one unearned, tied a career-high six strikeouts, and walked one. The OVC saves leader Justin Hoyt, entered the game with the tying run on deck in the ninth inning and shut the Redhawks down en route to his 10th save of the season. Southeast outhit the Gamecocks 10-8 but two errors by the Redhawks in the game led to a pair of unearned runs for JSU. Redhawks’ leadoff hitter Trevor Ezell wasted no time putting Southeast on the board with a solo shot to left to begin the game, putting the Redhawks up 1-0. A pair of walks issued by Lucchesi in the bottom of the fourth led to trouble for the Redhawk starter. Clayton Daniel drew a leadoff walk to begin the inning and moved up to second on a one-out walk issued to Tyler Gamble. Daniel stole third and scored on a bloop single to center by Elliot McCummings, tying the game at one run apiece. Daniel used a one-out, two-run triple ripped down the right field line to take a 3-1 lead on Southeast in the fifth inning. Taylor Hawthorne flew out to center for a sac fly, scoring Daniel and increasing the lead to 4-1 over the Redhawks. Ezell picked up the Redhawks’ first hit since the fourth with a two-out dribbler through the right side in the top of the seventh. Dan Holst laid down a perfect bunt that Officer picked up and threw away. Ezell scored on the error and Holst ended up on third on the play, 4-2 JSU. Branden Boggetto flew out to deep left, ending the scoring opportunity for Southeast. A one-out fielding error by Hunter Leeper led to a pair of unearned runs for the Gamecocks, extending the lead to 6-2 in the bottom of the seventh. Siddle’s record-setting 77th career appearance came in the eighth inning. 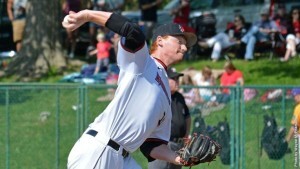 Siddle allowed two hits but struck out one and used a 4-6-3 double play to recorded a scoreless inning. Pinch hitter Andy Lack singled up the middle with one out in the ninth followed by a two-out single to left by Holst. The Gamecocks went to Hoyt to face Boggetto who drew a four-pitch walk. Representing the tying run, Garrett Gandolfo struck out looking to end the game. Holst was responsible for three hits in the contest while Ezell had a pair and the only Redhawk RBI. McCummings was the only Gamecocks with more than one hit going 2-for-3. Daniel and Hawthorne each drove in a couple. The Redhawks will look to even the series Saturday behind Clay Chandler at 1 p.m. against the Gamecocks.